If pricey stocks and low dividend yields have you frustrated, it’s time to consider publicly traded (and perfectly legal) “tax loopholes” that yield up to 9.8%. They’re as easy to buy as any stock or fund – in fact, they are stocks. They just happen to pay more. Private equity investing is a proven way to print money. Problem is, it’s typically expensive for individual investors like you and me to get involved. Private equity minimums range anywhere from $10 million at the high end to “just” $250,000 depending on the fund. 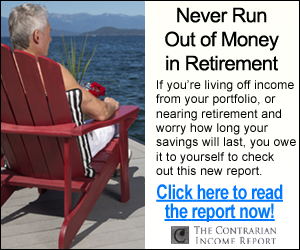 Frankly, that’s more than most normal retirement investors can or even should put in any one investment. Luckily, you don’t need $250,000 or even $2,500. One niche area of the market not only lets you tap private equity for less than $10 in some cases … it also typically delivers yields of anywhere between 7% and 12%! Business development companies, or BDCs, are in fact publicly traded loopholes that give you and I access to the explosive potential of small, growing companies. BDCs essentially help capitalize small and mid-size businesses with equity and debt deals – in fact, that’s the very reason they exist. Congress created BDCs in the 1980s to help spur investment in small businesses. That’s the same blueprint Congress followed when it created real estate investment trusts (REITs) in the 1960s – and in fact, BDCs are very similar to REITs in that, in exchange for certain tax breaks, they must return at least 90% of their taxable income back to investors in the form of dividends. They’re not chintzy. In fact, BDC ETFs typically yield at least twice as much as the most popular REIT funds! BDCs are income powerhouses. But their dividends don’t come without risk. It’s a competitive practice, and some firms are more sensitive to rising interest rates than others. The result is a high number of dead-weight BDCs that might yield 10% today but sit at risk of a dividend cut tomorrow. Let me show you the right way and the wrong way to scoop up the fat dividends in this little-covered, underappreciated sector. Here are three BDCs that provide access to private-equity-esque investments while yielding between roughly 7% and 10%. The Gladstone name should be familiar among high-yield investors – that’s because it’s the name behind a whole family of different public investment vehicles. This group includes the likes of Gladstone Capital Corporation (GLAD), Gladstone Commercial Corporation (GOOD) and Gladstone Land Corporation (LAND), which yield between 4% and 9%. But today, I want to focus on the 7% yielding BDC, Gladstone Investment Corporation (GAIN). Gladstone specializes in deals involving lower-middle-market companies generating between $20 million to $100 million in annual revenues, typically aiming for a blend of 75% debt and 25% equity. Its portfolio runs the gamut, though manufacturing, consumer products and business services/distribution companies are the most prevalent holdings. It even holds a few companies you may have encountered (with or without knowing it), such as Country Club Enterprises – the distributor behind Club Car and E-Z-Go golf carts. Net interest income (NII) – an important measure of BDC profitability – has been in a general uptrend for years. NII did dip in fiscal 2018, but the company still saw improvements in other operational measurements; net assets per share resulting from operations surged ahead by 27% for the year, for instance. GAIN’s steady performance fuels a steady monthly dividend yielding just below 7%. Better still, you can buy the BDC right now for a fair price that sits right at NAV. 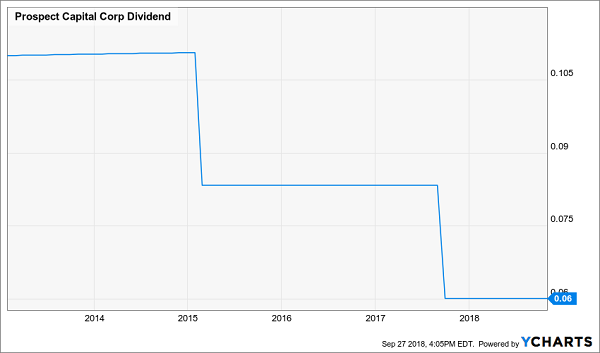 A dividend reduction is unwelcome, indeed. But a track record of payout That’s about as big and red as a flag gets. Watch PSEC’s Dividend Disappears In Front of Your Very Eyes! 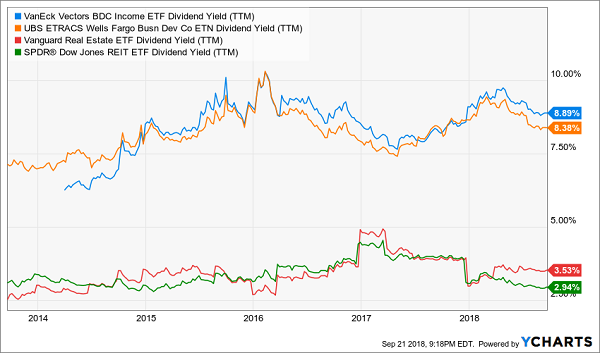 Prospect Capital Corporation (PSEC) often sits in the higher end of the BDC yield spectrum, but that’s in part because of its nasty habit of holding onto unsustainably high payouts as long as it can before finally caving and slashing it to more affordable levels. But despite these extra arms, Prospect Capital is an average-at-best business development. The company finished fiscal 2018 with another dip in net interest income, and still looks positioned to underwhelm investors – just as it has for years. PSEC has delivering just 19% in total returns over the past five years – less than the VanEck Vectors BDC Income ETF (BIZD) and less than a quarter of what the S&P 500 has produced over the same time. Capital Southwest (CSWC) is a small-cap BDC, but one on the rise – it recently ascended from the ranks of the microcaps for the first time since it became a BDC in 1988 IPO, clearing the $300 million threshold for small-cap status. The company provides “debt and equity capital for new platform acquisitions, dividend recapitalizations, refinancings, bolt-on acquisitions and growth financings.” It invests across numerous sectors, though its preferred sectors include industrial manufacturing, value-added distribution, specialty chemicals and tech-enabled services, among others. It has a “two-pronged” investment strategy. Its core is “lower middle market” companies with $3 million-$15 million in EBITDA, and then it takes more aggressive shots at “upper middle market” companies in excess of $50 million in EBITDA, with a willingness to use a bit more debt leverage than in its core deals. Just about every metric indicates that Capital is making the right bets. Capital Southwest lives on the edge a bit. Its portfolio companies often aren’t exactly investment-grade, and many of its loans tend to be short-duration secured in nature as a result. So CSWC isn’t exactly a risk-free play, but you can fall back on a thick 7%-plus yield that’s growing – rapidly so. Only a few BDCs will perform well over the long haul. This is an ugly industry that better suited for speculation than retirement savings. If you’re looking for more stable dividend machines, I have three superior ideas for you at the moment. 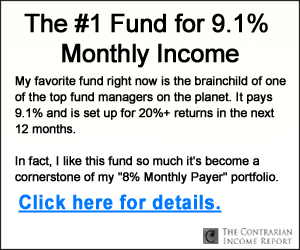 Right now, I think investors are better off looking in three other corners of the income world. You won’t hear about them on CNBC, or read about them in the Wall Street Journal, because they don’t buy advertising like Fidelity and other firms. 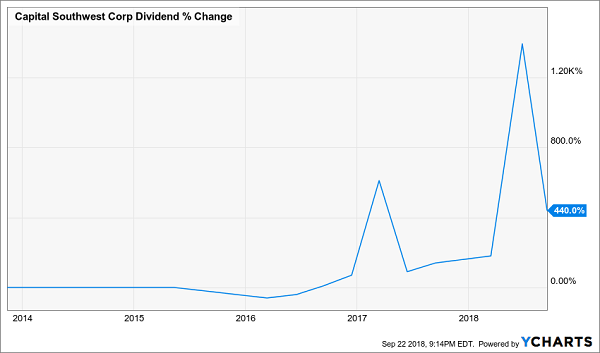 But their relative obscurity is great news for us 8% dividend seekers.